and fossils for you to discover. Many of these sites are designated as Local Geodiversity Sites, and are described in the Geoconservation section of this website; you can also access free pdf leaflets prepared by the Lothian and Borders GeoConservation group. The Society has published a detailed excursion guide to this area: ‘Lothian Geology – an Excursion Guide‘ by McAdam & Clarkson, 1996. 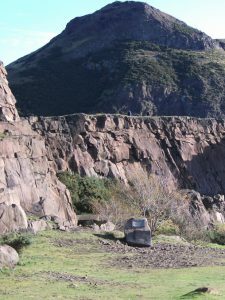 Edinburgh has many Earthcaches: specific locations where you can learn about local geology. This is similar to Geocaching but doesn’t involve a physical cache: instead you visit a specific location and observe the geology. Visit our Earthcache page to find out more and purchase the souvenir Edinburgh EarthCache Geocoin. 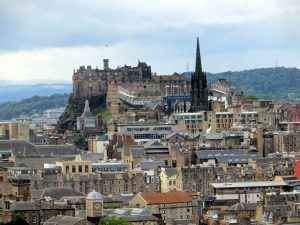 The city centre is constructed on a spectacular crag-and-tail landform, created by glacial erosion over and around the Castle Rock. Deep glacial scoops form the Grassmarket and Princes Street Gardens. Everywhere you can see the use of local stone: in the austere grey sandstone used for the finest buildings (much of it from Edinburgh’s most important quarry at Craigleith) and in the dark sets of the paved streets, dolerite quarried from local sill intrusions. There are fine views out across the city, towards Arthur’s Seat with the imposing cliff of Salisbury Crags in front, or northwards to the Firth of Forth. And in the narrow closes and stairs of the Old Town, you can appreciate the challenges that the topography created for the developing city, overcome by the building of the great stone bridges that cross the valleys and connect the High Street to level ground to the north and south. The raw outline of Scotland’s most famous volcano towers above the city centre. You can walk across lava flows and into the heart of the extinct volcano, which erupted 342 million years ago. Standing on the summit of Arthur’s Seat, you are deep inside the old crater. In eruption after eruption, the volcano slowly built up: the final summit may have been 200 metres higher than today’s hill. Erosion has cut deep into the flanks of the volcano, and it is tilted eastwards. This exposes different levels, including a succession of lava flows at Whinny Hill, parts of the volcanic vent and minor intrusions. There are interesting exposures of vent agglomerate, created by explosive eruptions, along the Queen’s Drive. The Crags are a single sheet of tough dolerite rock, which is about 325 million years old. This dolerite formed long after the eruption of the Arthur’s Seat volcano, by the process of magma intrusion deep underground – this was not a volcano. Magma rose to this level, then spread out horizontally, forcing its way between layers of existing rock. James Hutton was fascinated by the process, and explored Salisbury Crags in detail. In the quarries for roadstone along the front of the Crags, Hutton found the exposed lower junction between existing sedimentary layers and the dolerite of the Crags. One important exposure, now called Hutton’s Section, helped him explain the relationship between the different rocks, and supported his assertion that igneous rocks were crystallised from magma. James Hutton lived at 3 St John’s Hill from 1770 to his death in 1797. The site of this house is now marked by a memorial garden, with a plaque and several boulders illustrating some of Hutton’s key ideas. The garden can be accessed from Veiwcraig Gardens off Holyrood Road, take the steps up to the garden from the first bend of the road, near to the Holyrood Road NCP Car Park – Edinburgh EH8 9UL. Blackford Hill lies to the south of the city centre, and has great views over Edinburgh, Arthur’s Seat and Salisbury Crags. The hill is made of lava flows erupted about 410 million years ago, the last visible volcanic eruptions of an extensive period of volcanic activity that formed the Pentland Hills to the south. 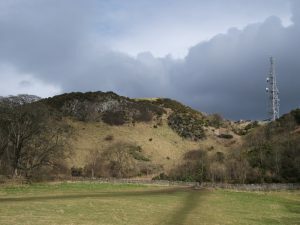 Blackford Hill has been extensively eroded by ice, a characteristic crag-and-tail shape with a long gentle tail to the east. North and south of the hill there are shallow scoops, gouged by deflected ice. This is an important site in the history of glaciology in Scotland, because of the visit to Edinburgh by the Swiss geologist Louis Agassiz in 1840. He proclaimed “this is the work of an ice sheet” when he was shown scratches on the side of Blackford Hill – the site now celebrated as Agassiz’ Rock. This was the first recognition of the importance of ice erosion in creating Scotland’s landscape. To the west of the city centre, Corstorphine Hill is a quiet nature reserve, a long wooded ridge running north from Edinburgh Zoo. Many paths criss-cross the hill, offering peaceful walks, some geology and views across Edinburgh and beyond. On the north-east side, overgrown quarries expose layered sedimentary rocks (sandstone and flagstone); above this, the main ridge is made of tough dolerite rock, part of a sill formed by magma forced between existing rock layers. 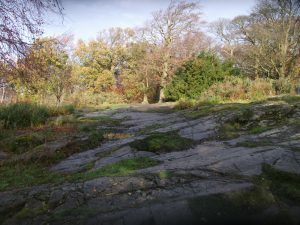 This formed at about the same time as Salisbury Crags, but the key difference is that the rock layer of Corstorphine Hill is tilted to the west, forming a smooth ramp for ice sheets to slide up and over the hill. Thus Corstorphine Hill is a very different shape from Salisbury Crags, and the top surface has been beautifully smoothed and striated by ice grinding uphill. Edinburgh’s river flows from the Pentland Hills to the Firth of Forth, a varied course which in places cuts through and exposes bedrock in dramatic gorges. 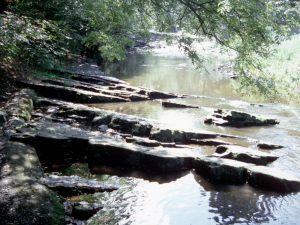 These gorges were eroded by glacial meltwater at the end of the last glacial period, around 15000 years ago, one example lies upstream from Stockbridge. Underneath the Dean Bridge, you can see some of Edinburgh’s sedimentary rocks in an impressive cliff of sandstone and mudstone. The bridge is impressive too, constructed using blocks of Craigleith sandstone in 1832. Beside river, there are two medicinal wells, St Bernard’s and St George’s, mark the site of natural springs where ground water rises to the surface next to impermeable dykes – vertical seams of igneous rock. 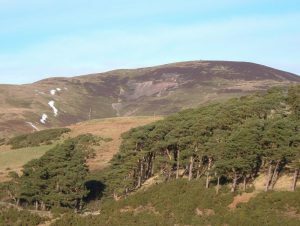 The Pentland Hills are a special place, a magnificent backdrop to the city of Edinburgh that can be seen and recognised from miles away. The hills are formed mostly of lava flows and ash horizons that are more than 400 million years old: the rock types found here include basalt, andesite, trachyte and tuff. In places, however, we can see beneath the lava flows and discover the oldest rocks of the Lothian area. These sedimentary rocks formed on the floor of the Iapetus Ocean around 430 million years ago, and were later uplifted and folded, so that the layering is now nearly vertical. This pretty seaside town in East Lothian has a dark past, the site of some violent volcanic eruptions that filled the sky with ash. 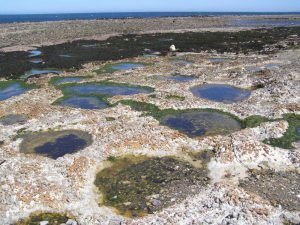 Most of the coastline from North Berwick to Dunbar is volcanic, a series of volcanic vents and plugs with plies of green and red tuff layers formed from volcanic ash. There are several offshore islands, all of them made of tough igneous rock. 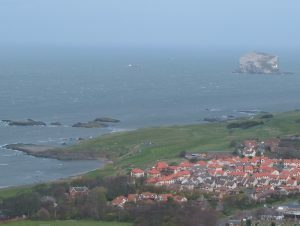 Bass Rock is the largest and most famous, a volcanic plug that is home to the world’s largest Nothern gannet colony (and it gives them their scientific name, Morus bassanus). Berwick Law, to the south of the town, is another volcanic plug and a crag-and-tail landform. Barns Ness (also called Catcraig) is a coastal section a few miles east of Dunbar, with several fine, fossil-rich limestone layers formed early in Carboniferous period, around 350 million years ago. Fossils include crinoids, brachiopods, bivalves, corals (Siphonodendron and Koninckophyllum) and trace fossils. The limestones are part of a cyclical sequence that includes thin coal seams and seatearths, mudstone and sandstone. In the 18th century the limestones were quarried and burnt for agricultural lime – you can see the limekiln on the coastal path. Today, the limestone is quarried for use by the cement works that lies just to the north. 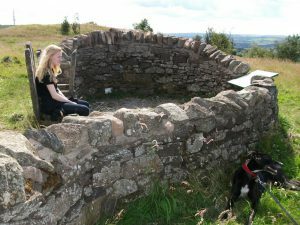 This low range of hills between Bathgate and Linlithgow includes several fine view points including the Cairnpapple archaeological site and the Witchcraig Geological Wall. The hills are formed of basaltic lava flows, but later intrusions formed tougher dolerite – Cockleroy Hill, for example. Within the lava flows, there are several layers of limestone, which were quarried for agricultural lime and are rich in fossils. This is also a site of unusual mineralisation at Hilderston near Cairnpapple, quarried intermittently from the 17th century for silver, lead and zinc. One of Scotland’s most famous fossils, ‘Lizzie’ (a 335-million-year-old tetrapod amphibian that lived on land) was found at East Kirkton by Stan Wood in 1985 and is now on display at the National Museum of Scotland. James Hutton, founder of modern geology, visited Siccar Point by boat in 1788, an event which led to a profound change in the way the history of the Earth was understood. A man ahead of his time, James Hutton used the evidence from Siccar Point to decode Earth processes and to argue for a much greater length of geological time than was popularly accepted. As John Playfair later recorded of their visit “The mind seemed to grow giddy by looking so far back into the abyss of time”. A concept of ‘deep time’ emerged with the recognition that the geological processes occurring around us today have operated over a long period and will continue to do so into the future. Siccar Point is an angular unconformity between the steeply tilted, eroded rocks of the Southern Uplands and the overlying, younger layers of red sandstone. It still looks much the same as it did in Hutton’s day, lying at the foot of a steep grassy slope. The key features of the unconformity can be viewed from the top of the slope, and this viewpoint is a short walk across a grassy field from the nearest road. The museum is based at the Lady Victoria Colliery at Newtongrange, just nine miles south of Edinburgh. This is one of the finest surviving examples of a Victorian colliery in Europe. Visitors to the museum can explore the story of coal, find out what life was like for the miners and their families, take a guided tour of the pithead and view the massive winding engine – the largest steam engine in Scotland – which hauled men and coal up and down the pit shaft for nearly 90 years. It is still in working order. "Siri, where can I find out the closest Devonian sedimentary rock?" -- "What would I know, ask the make-a-map by @BritGeoSurvey!" Lochaber Geopark’s Crowdfunding Campaign is now live - follow the link to pledge support and bag yourself some exciting rewards! Thank you to @PtmurtonG for fronting our Crowdfunding campaign and @davemacleod09 for making the film. Better than a movie: @IRIS_EPO offer lots and lots of geology-related GIFs, most of them earthquake related! Especially useful for teachers but interesting for everyone. A lot of you already use the great @BritGeoSurvey iGeology app. Did you know that now there's also a 3D version? Aim your camera at the landscape around you and the app gives you information about it. The Edinburgh Geological Society is one of the UK’s foremost geological societies, whose aim is to promote public interest in geology and the advancement of geological knowledge. We are a friendly and informal organisation with a wide range of members of varied backgrounds and interests.